Ahnapee Trail, photo courtesy of Friends of Ahnapee Trail. Cycling routes are a little more connected in Sturgeon Bay now that an extension of the Ahnapee Trail is complete. The Door County Facilities and Parks Department announced the extension of the Ahnapee State Bike Trail between Utah and Michigan Street is now open to bike and foot traffic. The project became a reality through the financial aid of Federal and State Grants, as well as the financial support of the Friends of the Door County Parks Group and the persistent nature of department staff. The multimodal dual trail extension is just over .5 miles long designed to serve pedestrians, bicycles and snowmobiles on two separate designated trails. Engineering of the trail complied with all Wisconsin Department of Natural Resources and Army Corps of Engineering requirements with respect to wetland permitting and trail building requirements. Future maintenance of this extension will be the responsibility of the Door County Facilities and Parks Department in cooperation with WISDOT right-of-way agreements. 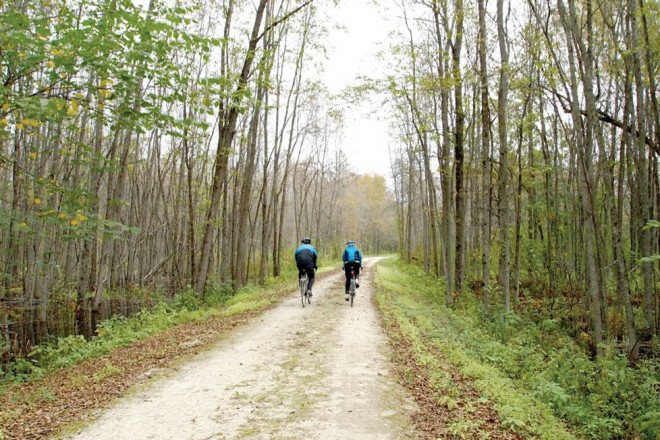 “Door County’s Trail systems are one its greatest and most popular assets, and it’s great that this trail extension will provide visitors and residents further recreational and transportation opportunities that also supports healthy lifestyles,” said Door County Parks Superintendent Ben Nelson. Improvements to the section of the Bike Trail South of the Bayview Bridge has also been completed. Upgrades to improve the surface and eliminate potholes, uneven surfaces, and degraded asphalt were completed. Future maintenance of this section of trail will be the responsibility of the Door County Facilities and Parks Department in cooperation with WISDOT right-of-way agreements.